“Social media” as we know it has been around for a decade now, and there is no excuse for any progressive organization (or artist, or business, etc.) to not take full advantage of its power. It’s time to stop making rookie mistakes. It’s time to stop going through the motions and thinking that just because your organization or campaign has a Twitter, that that means anything. 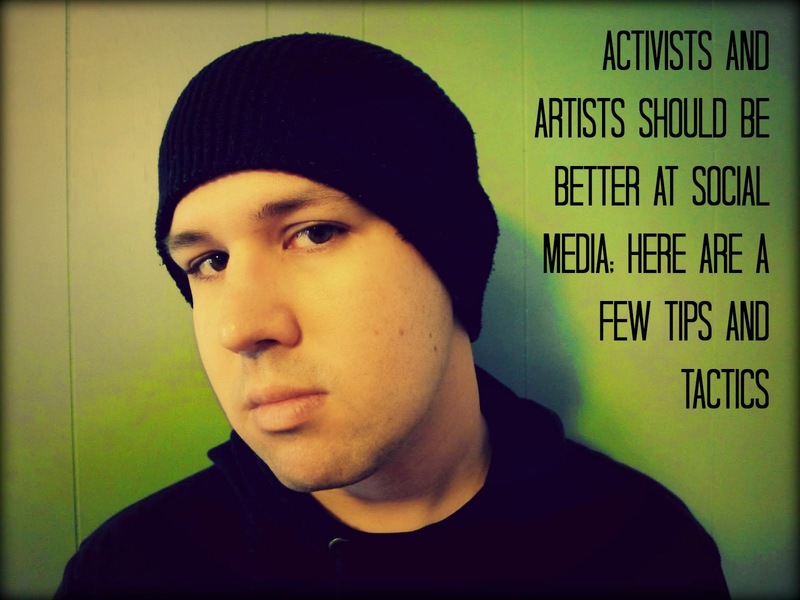 So in that spirit, I wanted to gather a few helpful tips, tricks and strategies for people—particularly activists and artists—who want to use social media more effectively. This won’t be a guide on how to get a million followers or an in-depth look at web analytics or anything—more of an intro for those who might know the basics, but still feel a little intimidated. Which Platforms Are Most Important? There are many social media platforms out there, but we’re going to focus on Facebook and Twitter. Those two are vital, whether you’re a nonprofit trying to reach more people with your message or an up-and-coming rapper trying to build your brand. YouTube is a big one too, but using it is a little more self-explanatory; furthermore, mastering Facebook and Twitter will help you use YouTube more effectively too. It’s definitely worth it to look into Tumblr and Instagram too (and SoundCloud if you’re a musician). These are all growing and can be very useful tools. For the sake of space, though, let’s focus on Twitter and Facebook. Have a home-base. For me, my social media sites are tentacles all reaching out from my primary site. Whether your home-base is a professional website you built, or a wordpress blog, or even a Tumblr, it’s good to have one. This is the place where people can find all the information they’d ever need about you or your organization. When you’re posting on social media, you can post links that lead people back to your primary site. Don’t link your Twitter and Facebook accounts together. There are tools that will let you do this, so you only have to post in one place instead of two. But as we’ll see below, the two platforms have different rules when it comes to posting. Better to do a little extra work and keep them separate. Post videos and photos, not just text status updates. People like looking at things more than just reading about things. Take advantage of all the media at your disposal. Engage with others. Don’t forget the “social” element of social media. These aren’t just platforms for you to promote yourself. That’ll be part of what you do, of course, but to really maximize your reach, you have to have conversations, promote other people’s work, ask questions, get into debates, reach out to others and engage. Of these two platforms, Twitter is arguably looser and more flexible. It works as a tool to promote specific events or links, but its real value is its ability to broadcast your personality and build your brand. It lends itself to random thoughts, jokes, links to good articles, questions, and whatever’s on your mind. The first question everyone asks: how do I get more followers? There’s no magic key. If you follow a lot of people, some of them will follow you back. If you say insightful things or post interesting content, people will “RT” (retweet or re-post) what you’ve posted, and more people will follow you. If you engage with others and have conversations, more people will follow you. Most importantly (by far), if you exist in the real world and do good, interesting things in real life, more people will follow you. A hashtag (#something) is a way to find people from all over talking about the same subject. If you’re talking about racial justice, and you add #racialjustice at the end of your tweet, you can then click on that and see everyone else in the world who is posting with that same hashtag. If you’re at an event, rally or march, this can be a powerful organizing tool too—if everyone is posting with a (for example) #rallyforjobsMN hashtag, everyone can be on the same page. Twitter is fun, but right now, Facebook is where most of your engagement is really going to happen. When I post links back to my primary website on both platforms, usually about 90% of the traffic is driven there by Facebook. The key word is intentionality. Resist the urge to post whenever you have a thought. You have to consider time of day, frequency of posts and other factors. I generally post once in the morning (around 8am) and once at night (around 9pm), because that’s what I’ve found to be effective when it comes to maximizing my reach. But I’m an artist; your audience might be online at different times, especially if you’re an activist organization or a nonprofit. Trial and error. I try not to post more than twice per day. A lot of people I know only post once per day. Some do more, but again—the more you post, the more you dilute the power of an individual post. I don’t have the tech background to understand how this works, but it’s what I’ve found. Strive for interactivity; rather than just posting a link to an event, post the link and try to start a conversation about that event. Ask questions. Show your personality. Don’t forget about the “use Facebook as your page” button. If you add other pages to your page’s “favorites” list, you can then log in as your page (as opposed to your personal profile) and comment on their posts. This is a great way to increase your visibility and build community. Having a social media presence is never enough. Real success—whether you’re running a political campaign or just trying to get famous—comes from hard work, old-fashioned face-to-face outreach/networking, and substance. But social media is still an invaluable tool, one tactic in what has to be a larger strategy. Of course, it’s about the work first. Having a million Twitter followers to promote to doesn’t mean anything if the work itself isn’t worthwhile. But you’re probably doing good work. If that’s the case, it is not just in your best interest to promote it, it your responsibility to promote it. Social media will never be the only way to do that, but in 2013, there is no reason not to take advantage of its power. This is all clearly just the tip of the iceberg, though. What strategies, tips and tactics have worked for you or your organization?